Dads are special to us. They are essential to a child’s well-being, and while we often box “dad” into the provider/fixer upper/grunt work of parenting there is a great value in the emotional stability they can provide. This softer side of dad needs pampering and attention too. This year indulge dad with a Father’s Day spa gift to show him how much you appreciate all the ways he loves and supports you! Here are some of our treatments specifically geared towards men. Our “mancial” if you will, is specifically designed for men. It focuses on both relaxing and reinvigorating by cleansing and extracting dirt and grime as well as a scalp massage. We finish this men’s facial by soothing mask, leaving dad feeling and looking energized! Does dad have some ink from his yesteryears that he no longer wants? We offer laser tattoo removal with Revlite™, an FDA approved tattoo removal device safe for skin types I through VI, allowing it to successfully treat all skin tones. The Revlite tattoo removal system is recognized as the gold standard, nanosecond aesthetic laser and tool of choice for highly effective tattoo removal. With multiple, clinically proven wavelengths to effectively treat full color spectrum ink colors on all skin types, the Revlite is the tattoo removal choice for superb results. This is our version of a deep tissue massage. 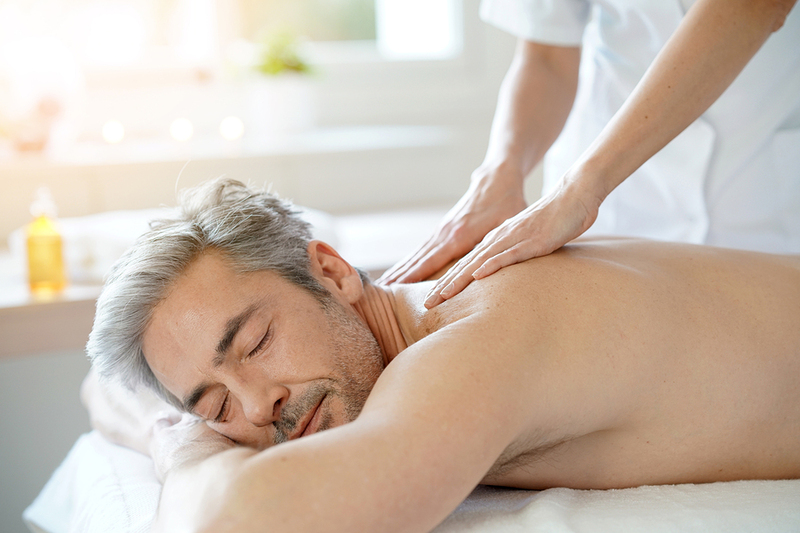 It’s a therapeutic treatment that can be customized for optimal relaxation and stress reduction by focusing on specific parts of the body which many need special attention. It will help to relieve any of his pain, reduce his stress and restore his balance of body, mind and spirit. A spa treatment is a sure way to show dad how much you appreciate him! You can give him a gift certificate, or surprise him by scheduling a time to hang out, and then take him to his spa appointment. While you’re at it, schedule one for yourself at the same time – it’s another great way to bond with the man who shaped who you are today!